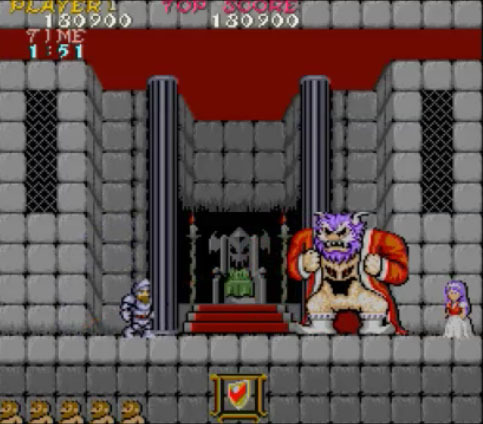 Ghosts’n Goblins is single player action side scrolling 2D platformer. It is known as Makaimura in Japan which roughly means "Demon World Village" in English. 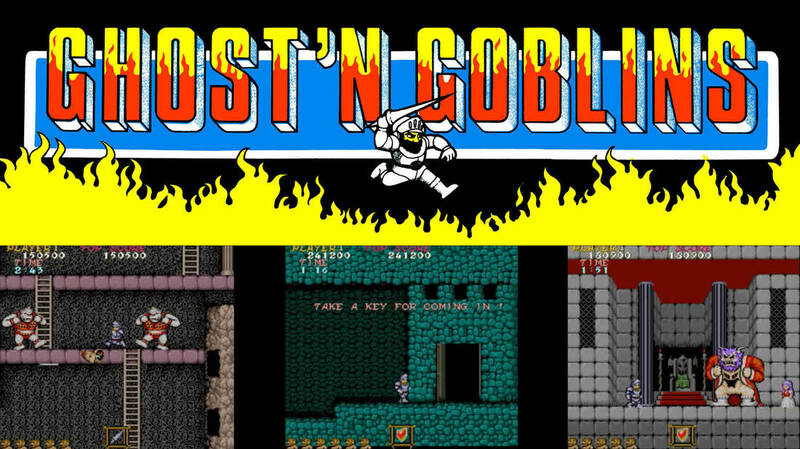 It was released in arcades in 1985 and is the first game that takes place in the Ghost'n Goblins world. If you take into account all of the games that are connected to Ghost’n Goblins in some way there are 17 video games but only 7 of them are in the main storyline. A knight by the name of Sir Arthur has set out to rescue the love of his life Princess Prin Prin, who has been kidnapped by Satan, King of Demon World. That’s right we said Satan, no pulling the punches by Capcom in this game. Ghosts’n Goblins is considered to be one of the toughest game even made and it still lives up to the reputation. 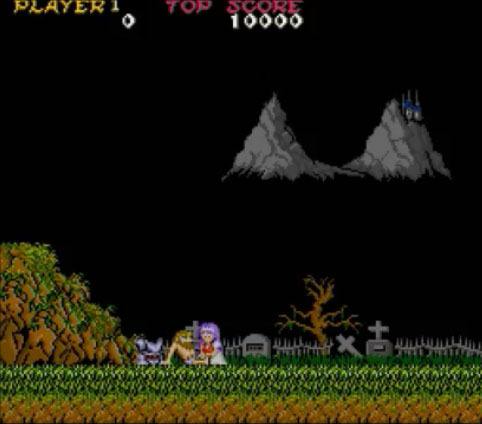 Ghosts’n Goblins was an arcade staple in the 80’s and even today many of us can help but drop a few quarters into the arcade game when we see one. But let’s get to the point THIS IS STILL ONE OF THE MOST DIFFICULT VIDEO GAMES TO BEAT IN IT’S ORIGINAL FORM EVER! How difficult well you can only get hit twice and even if you don’t take a hit you can still die because there are lots of one hit kills everywhere and there is a 3:00 time limit to get through each level. If you run out of time you are dead. But that is not even the worst of it…you can’t shoot up or down but your adversaries can attack you from all directions and the game cheats is small ways like letting the things hit you through walls that you can’t pass through. And, many times when you die you have to start all the way to the beginning of the level or a half way point. There is also a trick to actually defeating the game. 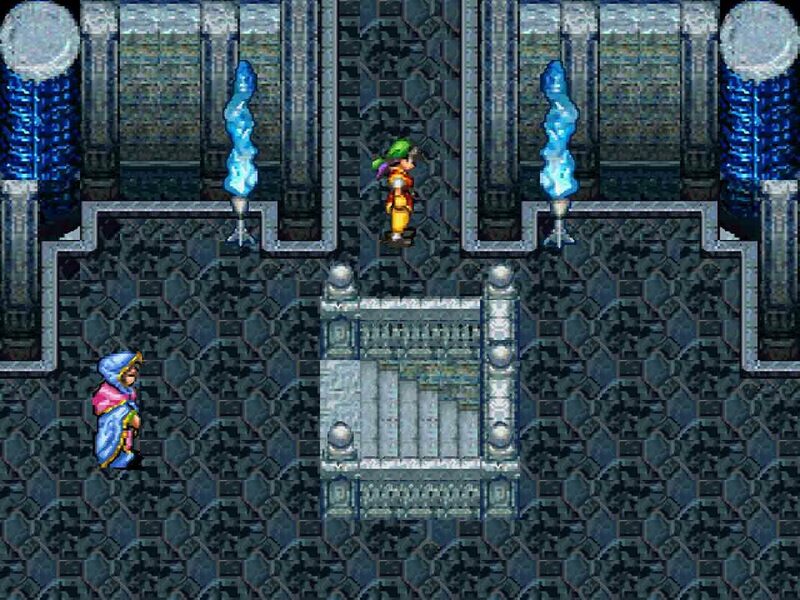 You can only defeat the boss with a cross weapon and if you don’t have one you go back to levels 5 to get to level 6 so you can fight the final boss again. After you defeat the final boss you discover that was all "a trap devised by Satan". You then have to replay the entire game on a higher level to reach the real final battle. It is insanity in arcade video game form. It may seem like we are complaining but thank to modern consoles you can play Ghosts’n Goblins without having to go through all of that but the original challenge level is still available. Then after you get so angry throw your controller at your TV because you can’t get past level 1. 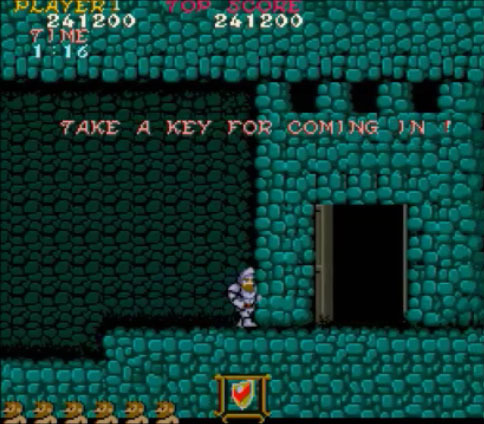 How long it takes to get all the way through Ghosts’n Goblins varies greatly. Today with new game modes you can change the challenge level and save anywhere you want in some versions of the game. You could get good enough and beat the game in under an hour or you could never get all the way through it. The controls are a mess, there is no other way to describe it. If you played the arcade version then a terrible controls adds to the nostalgia but if you never played this game before then you will hate it and wonder what is all the fuss about. Ghosts’n Goblins is worth playing $1.99 or under for. Truthfully it will be more appealing to gamers who prefer retro style video games or if you grew up in arcades.